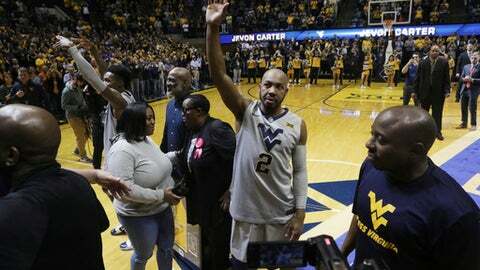 MORGANTOWN, W.Va. (AP) Backcourt mates Jevon Carter and Daxter Miles Jr. put on a show in their final home game. Carter scored 21 points, Miles added 18, and No. 20 West Virginia rode a hot start to an 84-74 victory over No. 12 Texas Tech on Monday night. Carter and Miles were honored in a pregame ceremony, which they capped off by kissing the floor at midcourt to a huge ovation. West Virginia kept the positive mood going in winning its third straight. West Virginia (22-8, 11-6 Big 12) broke a second-place tie with the Red Raiders (22-8, 10-7) and moved closer to earning the No. 2 seed in the Big 12 tournament with one game left in the regular season. Carter and Miles were efficient from the opening tip as West Virginia busted out to a 16-0 lead. Carter scored seven points and Miles hit a 3-pointer and fed Esa Ahmad for a pair of dunks during the one-sided opening sequence. ”When we play with energy, we’re pretty good,” West Virginia coach Bob Huggins said. Carter was thinking something different. ”Not to blow the lead,” he said. The Mountaineers have given up several double-digit leads in losses this season, including in a 72-71 setback at Texas Tech, and a hush came over the crowd when Brandone Francis‘ 3-pointer brought the Red Raiders within seven early in the second half. Carter, the Big 12’s reigning defense player of the year, told his teammates to get back on defense and ”just get stops. Don’t focus on the offense,” he said. Short-handed Texas Tech made just two baskets over the next six minutes and couldn’t keep up with West Virginia’s 10-player rotation. Lamont West and James ”Beetle” Bolden made 3-pointers and Bolden followed with two free throws to push the lead to 52-38, and it stayed in double digits the rest of the game. Sagaba Konate added 16 points, Esa Ahmad had 11 points and 11 rebounds, and Bolden scored 10 for the Mountaineers. Freshman guard Jarrett Culver scored 26 points, Niem Stevenson added 24 and Zhaire Smith scored 12 for Texas Tech, which lost its fourth straight. The Red Raiders were without injured starters Justin Gray, Keenan Evans and Zach Smith. ”You have to have multiple people play well, and tonight, just too much West Virginia,” Texas Tech coach Chris Beard said. Texas Tech: The Red Raiders shot 1 for 11 from the floor over the first seven minutes and were desperate to catch up after that. They went 23 of 44 (52 percent) the rest of the game. West Virginia: The Mountaineers made just 16 of 27 free throws (59 percent), a stat they’ll need to improve on if they hope to make a deep run in the NCAA Tournament. Beard didn’t hang the loss on not having three starters. Gray did not make the trip to West Virginia. He was hurt Saturday when he ran into a screen against Kansas. Smith had returned in that game after missing 13 games with a broken foot. Evans injured a toe in the first half of a loss to Baylor, and then scored in single digits in the next three games. On Saturday, Carter became the first major-conference player with more than 1,600 career points, 500 rebounds, 500 assists and 300 steals. He is 13th in career scoring at West Virginia and has the school record for steals. Miles is fifth in school history in career starts and is 29th in scoring. Texas Tech finishes the regular season at home against TCU on Saturday. West Virginia plays at Texas on Saturday.